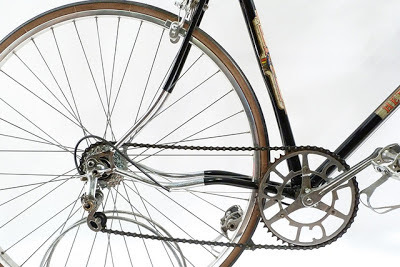 Perth Vintage Cycles: 1949 Hetchins road racing bicycle. 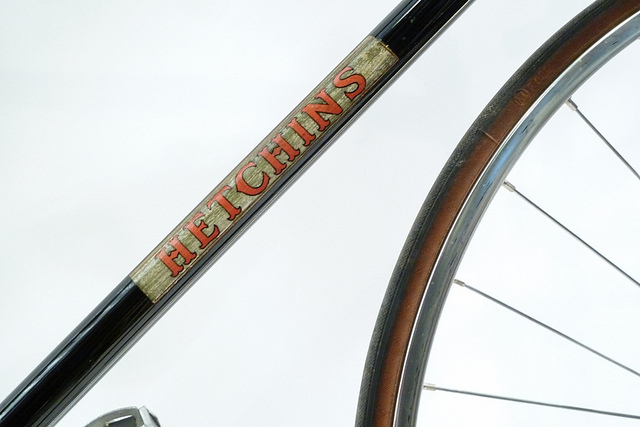 1949 Hetchins road racing bicycle. The Old Bicycle Showroom has often been referred to as "Britain's most traditional bicycle shop". 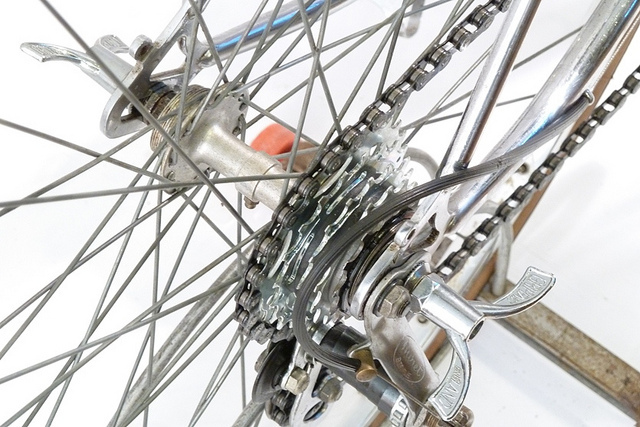 They dominate sales of vintage bicycle parts and often stock a varied range of classic vintage bicycles for sale. I have noticed an increase in their vintage bicycle stocks recently and always enjoy browsing through their on-line catalogue. 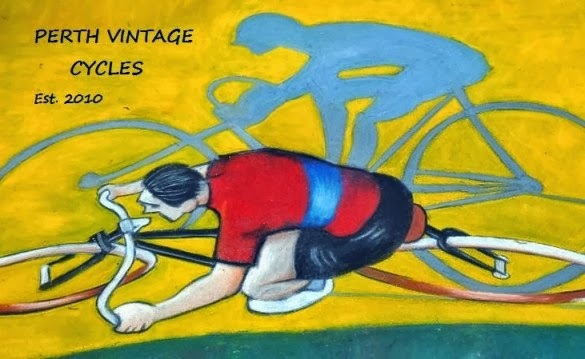 Log onto their site at http://www.theoldbicycleshowroom.co.uk/index.asp and subscribe to their mailing list to receive an updated list of vintage bicycles for sale. Their images of classic vintage cycles are always a pleasure to view. 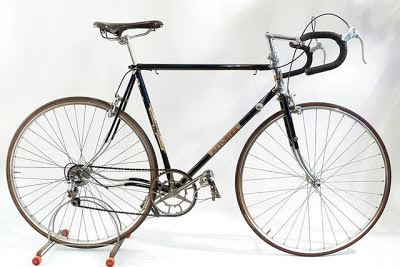 I recently spotted a magnificent 1949 Hetchins road racing bicycle on their list of vintage bikes for sale, however the item had been quickly snapped up by a discerning vintage bicycle enthusiast. The beauty of this bicycle blew me away....so I thought I'd share the images with you. 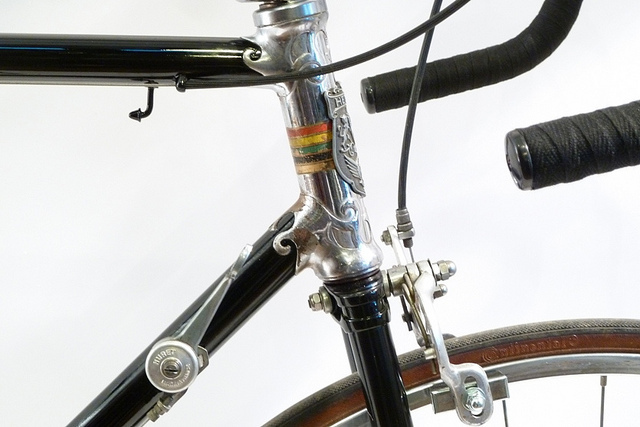 A typically curved 'Hetchins' chainstay and Chater Lea cranks. 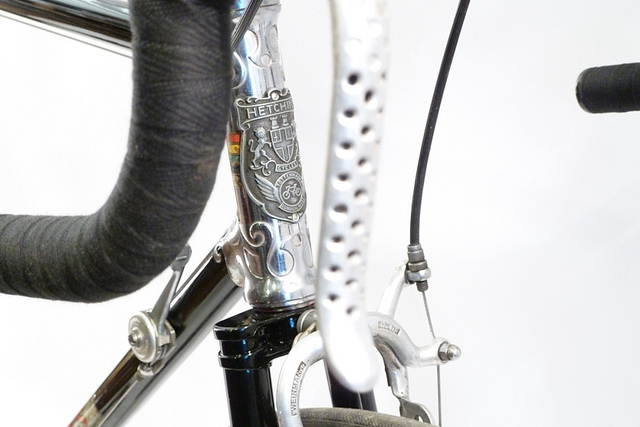 Magnificent "Hetchins" detailing on the head tube. Great lugs too!! 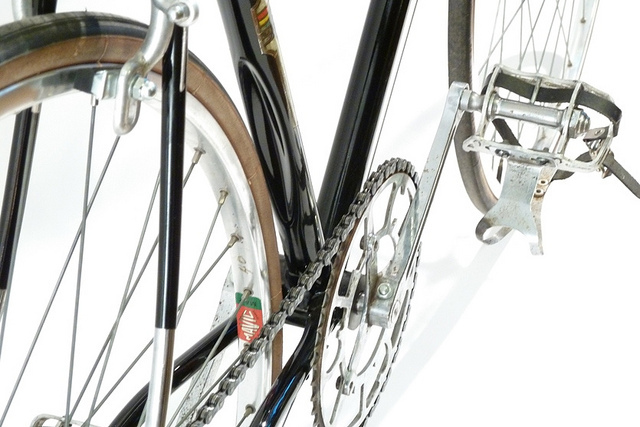 A rare and beautiful Hetchins six day model road racing bicycle with Super Special lug work. 22" frame re-finished in black enamel retaining the original transfers and original chrome work. Frame number: 493468. Apparently purchased from Hetchins the 21st March 1950 for £32-15s-1d as a complete bicycle according to the label with the bicycle. Bought recently as just a frame which was then sympathetically re-finished and then built up with period components with a few exceptions like the rims and brakes. A very rare bicycle from this sort-after maker with lovely patina. The frame has a concave indent just in front the rear wheel on the saddle tube which was a feature of this model. 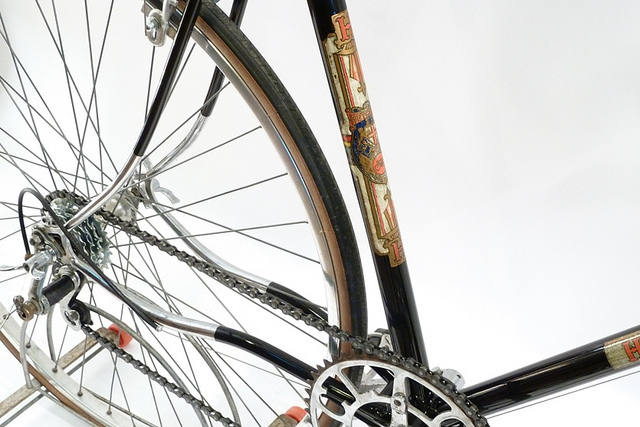 Well preserved seat tube decal - beautiful! An image capturing the indented seat tube. A classic chromed GB quilled stem. Huret 'Tour De France' Rear derailleur gear and lever. 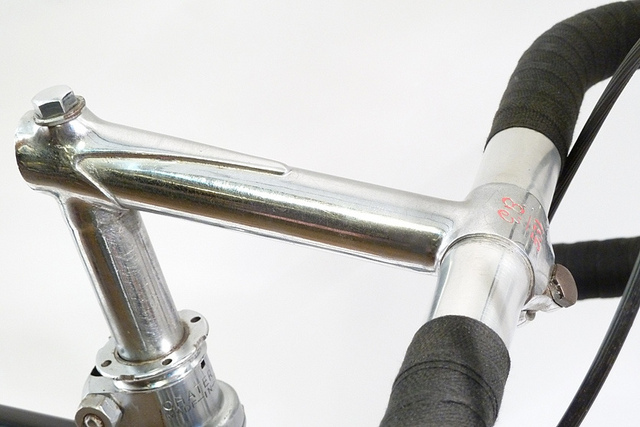 GB '531' chrome long reach handlebar stem. Original Brooks 'Swallow' leather saddle. Weinmann Caliper brakes and levers. R.E.G of Italy 'Special' toeclips. New 5 speed rear gear block. The 5 speed cluster is not original but provides the modern rider with greater flexibility. 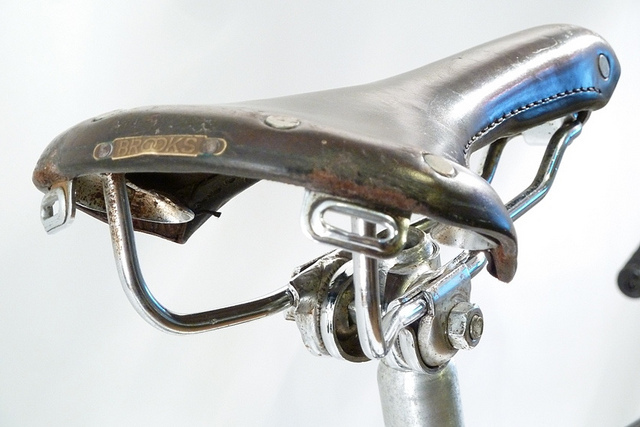 A classic Brooks Swallow saddle from the period. ....more front end detail, stunning! ﻿I suppose my favourite aspect of this build is that the original feel of the bike has been restored by re-painting the frame in black enamel paint and restoring the original decals. The bike has also been given a 5 speed cluster to provide the modern rider with greater flexibility. The Hetchins logo on the head tube is stunning, rivalled only by the chromed lug detail. The total package would be an ideal L'eroica cycling event contender!